Often two or more signals for the same security are an indication of a more robust result. After the close of Monday a DLPAL DQ scan of Dow stocks yielded two long signals for MRK. The stock gained 1.1% from the open to the close of yesterday. For workspace settings and data details please refer to previous articles. Below are the results as of the close of Monday, January 22, 2018. 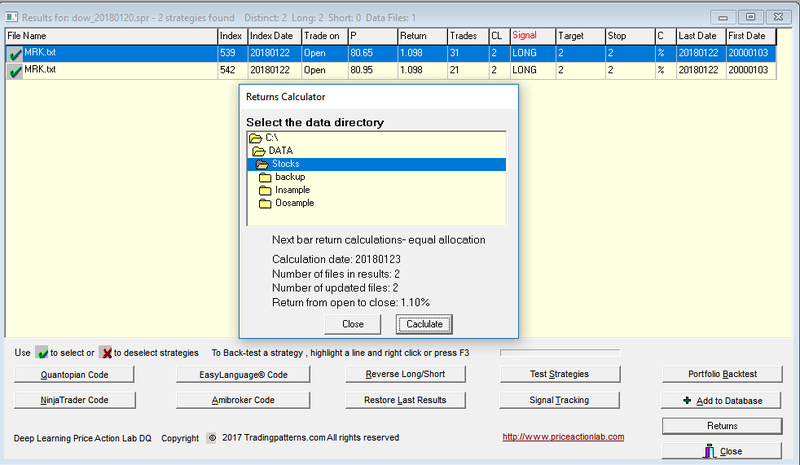 The returns calculator is also shown. There were two long signals for MRK. The stock gained 1.1% from the open to the close of the next day. Note that the Dow ended flat. Multiple signals for the same security often point to a more robust signal.